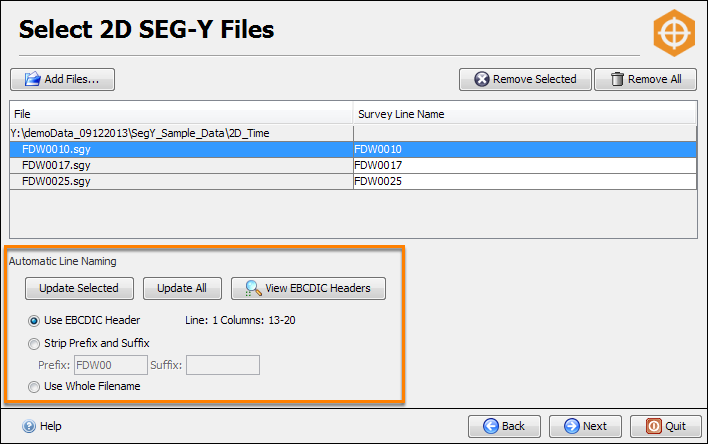 At this stage, you can select the 2D SEG-Y files that you want to import to Insight's DUGIO format. It is important to define the line names and load the different data types. A 2D survey in Insight is not a single line but comprises of a whole collection of 2D lines in an entire seismic acquisition. Meanwhile, data types define the types of data, i.e. "near stack", "mid stack", "full stack", "migrated gathers" or "interval velocity". 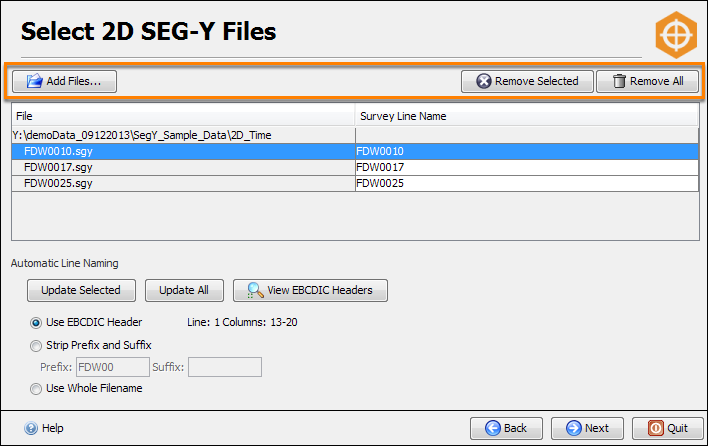 Add Files — Click this and select the 2D SEG-Y files that you want to load. A list of all the files you have selected will be displayed. You can add more files by clicking Add Files. Remove Selected — Click this to delete the selected files from the list of files you want to load. Remove All — Click this to remove all the 2D SEG-Y files in the list. The Survey Line Name column shows the names of the 2D lines. The line names should reflect the actual survey line names and NOT describe the data type. This is because you will probably load different data types for each line and you will want Insight to know that all the data types correspond to the same survey line. Hence, even if you are loading multiple different data types, the line names should not include the data type. Use EBCDIC Header — Select this option to name the 2D lines based on the line names in the EBCDIC header. Select a row in the table and click View EBCDIC Headers to view the line names in the EBCDIC Header window. Click Update All to update all the line names based on the EBCDIC Header or Update Selected to update only the selected line name. Strip Prefix and Suffix — Select this option to discard the prefix and/or suffix from the line names to reflect the actual line names and exclude other information like the data type. Click Update All to update all the line names based on this option or Update Selected to update only the selected line name. Use Whole Filename — Select this option to use the whole filename as the line names. This is advised only if the SEG-Y filenames reflect the actual line names, which is often not the case. Click Update All to update all the line names based on the whole filenames or Update Selected to update only the selected line name. Tip: If all three options do not help you to define the 2D line names appropriately, you can manually edit the names of the 2D lines. 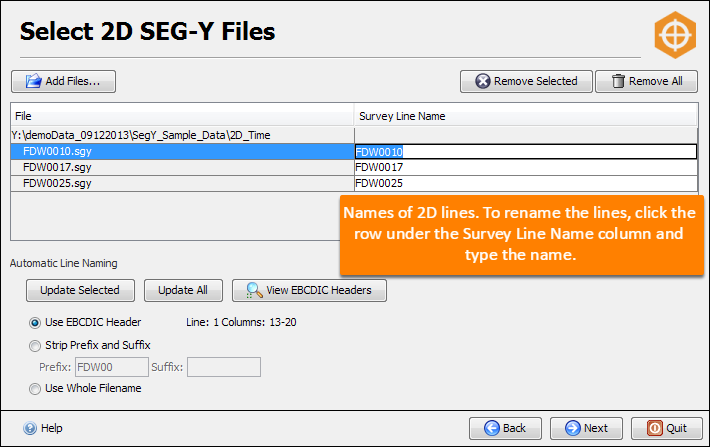 Click a line name under the Survey Line Name column and type the new name for the 2D line. Press the arrow keys or Tab to move to subsequent rows (Shift + Tab will move to preceding rows). The SEG-Y Loader is designed for you to load one data type at a time. On this basis, you can load many lines at the same time as long as all the lines are of the same data type. To load a subsequent data type for the same set of 2D lines, run the SEG-Y Loader again and use the same line names.